DVCPro is a variation of DV developed by Panasonic, and Apple applications like iMovie, Final Cut Express, Final Cut Pro support this source files for editing. AVCHD videos are commonly used in the HD camcorders by Sony, Panasonic, Canon and JVC. DVCPro is the Standard definition codec with 720x480, while DVCPro HD provides HD 1920x1080 and 1280x720. However, DVCPro HD codec is only available if when Final Cut Studio is installed on Mac, and I have Final Cut Express does not support DVCPro HD. Thus I would like to convert my Canon HF S11 AVCHD videos to Apple DV/DVCPRO - NTSC for editing in FCE. Via Google, I find Aunsoft Video Converter for Mac as the recommended AVCHD to Apple DV/DVCPRO - NTSC converter on Mac. It does not only allow you to trim and crop AVCHD footage, but also deinterlaces 1080i videos. Below is the guide about how to deinterlace Canon HF S11 AVCHD video to Apple DV/DVCPRO - NTSC for FCE. It also works for iMovie 8/9 and even 11. Step 1. Download Canon videos to Aunsoft Video Converter for Mac. Connect Canon HF S11 to iMac/MacBook Pro via USB cable, run Aunsoft Video Converter for Mac as the best Canon HF S11 AVCHD video converter on Mac Snow Leopard. Click the "Add" button to download 1080i .mts files from camcorder to the application. Step 2. Choose MOV with DV/DVCPRO - NTSC codec. 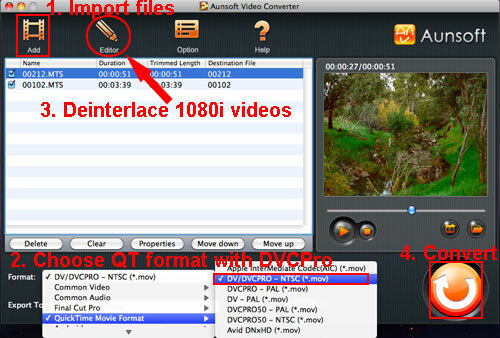 Click the "Format" option, and navigate to QuickTime Movie Format > DV/DVCPRO - NTSC (*.mov) as output format. The Mac Canon video to DVCPro converter will convert AVCHD files to MOV with DV/DVCPRO - NTSC compression. Step 3. Deinterlace 1080i AVCHD video. Select a clip on the file list, and the "Editor" button will be activated. Click the "Editor" button and go to the Effect tab to tick the checkbox for deinterlacing. The apply to all button is to deinterlace all the videos on current file list. Step 4. Convert Canon HF S11 AVCHD video to DVCPro for Mac. Click the convert button under the preview window, the Mac Canon HF S11 video converter will start the conversion and deinterlace AVCHD video to Apple DV/DVCPRO - NTSC for fast editing in Final Cut Express, iMovie, and other Mac applications. The DV/DVCPRO - NTSC profile only provides video in standard definition 720x480. If you want to edit HD videos at 720p or 1080p, 1080i in Final Cut Pro, just choose DVCPro HD 1080i, DVCPro HD 1080p, DVCPro HD 720p from the Final Cut Pro format group. I was informed that these options would work only when Final Cut Pro is installed.